Shihang, a global leader in manufacturing and supplying CuNi 90/10 & CuNi 70/30 pipes and fittings, was today featured for its high quality copper nickel pipes. SHANGHAI, CHINA, May 31, 2018 /24-7PressRelease/ -- Shihang, a global leader in manufacturing and supplying CuNi 90/10 & CuNi 70/30 pipes and fittings, was today featured for its high quality copper nickel pipes. This follows successful tests for the chemical composition of Shihang copper nickel pipes as per the DIN 86019 2.1972, EEMUA 144 UNS 7060X and ASTM B466 C70600 specifications. The Shihang copper nickel alloy pipes also passed critical mechanical tests. Consequently, the excellent mechanical properties will make it easier to process Shihang copper nickel pipes, whether for normal piping systems or fittings. "A proper balance of different chemical elements in a copper nickel alloy is key for an excellent corrosion resistance and mechanical properties," Kurt Yang, Shihang Export Manager. "By investing in high-tech material analysis tester and mechanical properties test machine, Shihang produces perfect copper nickel pipes. We have not had even a single complain from any of our clients globally and that's what Shihang stands for – strict quality control (QC)." 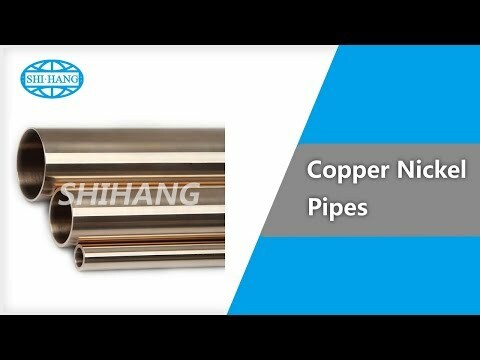 Shihang copper nickel pipes are highly resistant to corrosion and erosion. They protect the objects from biofouling and are also easy to weld. Using mechanical properties test machines, Shihang analyzes tensile strength, proof stress, effects of temperature, elongation and hardness. The test results for both the copper nickel 90/10 and copper nickel 70/30 are all available on the Shihang official website (shshihang.com). Furthermore, Shihang uses material analysis tester machine to analyze different chemical compositions in all its copper nickel alloy pipes. The analysis is based on the main standard specifications (DIN 86019 2.1972, EEMUA 144 UNS 7060X and ASTM B466 C70600). The chemical analysis test involves determining the amount of Cu%, Ni%, Fe%, Mn%, C%, Pb%, S%, P%, Zn% and other chemical elements. Shihang has adopted a strict chemical composition analysis focusing on raw material and final product quality control. Again, it analyses copper nickel pipes for proper fusion. All these aim to ensure Shihang copper nickel pipes meet the dynamic needs in marine, offshore and other piping systems. Shihang is an ISO 9001:2008 certified cuni pipes manufacturer.